This early location film is perhaps the first “scenic view” provided by the Edison Studios. By traveling to Niagara Falls in upstate New York, they were able to provide a view that would be exotic to viewers even in New York City and certainly in the rest of the world. We see a view that includes the top portion of the falls and looks down upon a group of men near a tripod. Two of the men point at various features of the landscape and another seems to tinker with the camera. Throughout, the falls roll majestically on. The background shows that it is a cold winter day, with snow on the trees and the ground. I said earlier that audiences may have become somewhat jaded about just seeing movement by 1896, but to our eyes today, this movie might seem to contradict that. Nothing happens, it just demonstrates movement by showing a waterfall. 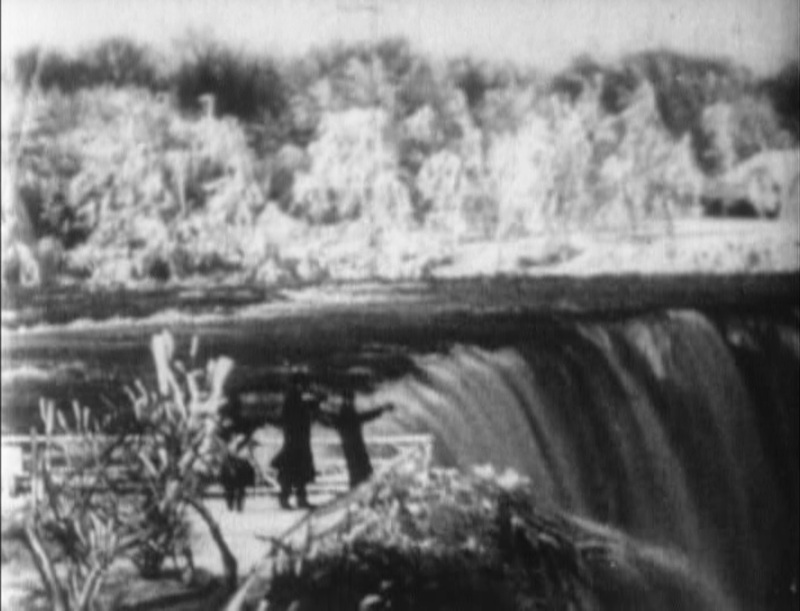 However, it’s important to remember that the opportunity to see a natural wonder in motion was very new at the time, and that many of the viewers of this movie would never, or maybe only once in their lives, have an opportunity to visit Niagara Falls. Movies like this helped to give people a sense of what it was like to be able to travel easily around the nation, and even contributed to a sense of national unity by bringing exotic locations directly to the people, as it were. While a good quality photograph lets you know what a place looks like, seeing it in motion brings it to life in an entirely new way.